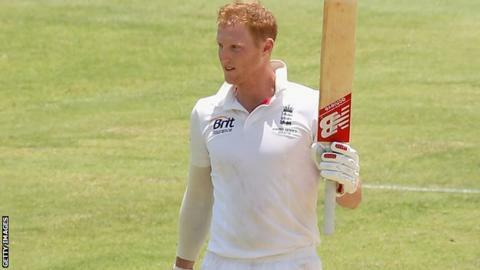 Durham coach Jon Lewis says they cannot afford cover for all-rounder Ben Stokes unless he gets a central contract from the England and Wales Cricket Board. Stokes played four of England's Ashes Tests this winter, but the ECB has not yet upgraded his 'incremental' deal. It means Durham receive £2,000 each time they lose him to England, rather than the ECB paying his entire salary. "We get paid after the event, meaning you can't plan. It makes things very difficult," Lewis told BBC Newcastle. "It works well for Ben and England. He gets a bit of cash and they have control of the player. "For us, there's no way we can commit to bringing an extra player into the squad without knowing for sure whether we're getting that money." That ended a nine-match losing streak against Australia, but throughout that run, Stokes has been one of few bright spots. The 22-year-old gave a match-winning performance, hitting 70 runs and taking 4-39. Added to his impressive Test series displays - during which he scored a century and took a five-wicket haul - his stock continues to grow. "We have to be realistic. If Ben continues in the same vein we won't see much of him," said Lewis. "But we cannot budget for his absence when he's not on a full-time central contract, so numbers will be challenging this season." In January's final Ashes encounter, Durham leg-spinner taking match figures of 4-82. Borthwick was a mainstay in team, regularly batting in the top order. "With Scott, he hasn't had the chance to grab a spot firmly yet, but there's a gap because of Graeme Swann's retirement," Lewis explained. "Last summer, [Durham bowler] Graham Onions was in and out of the England squad, and Stokes got called into the one-day team, so we've shown we can react well."